Magnum Research has been building quality firearms for over 30 years, and this Baby Desert Eagle III is no exception. Recognized by the industry as having one of the most reliable mechanisms around, this mid-sized steel-framed pistol features a 3.85" precision match barrel, double action/single action trigger, polymer grips, ambidextrous teardrop-shaped decocker and a reversible magazine catch for right or left hand shooters. The magazine holds 15 rounds. 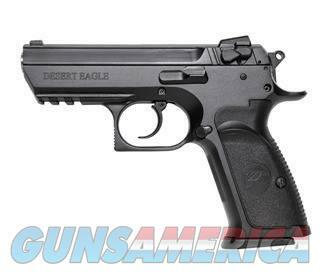 The Baby Desert Eagle features a precision land and groove match barrel, smoother trigger pull, and a reversible magazine catch for either left- or right-handed shooters. The integral tactical accessory rail makes it ideal for a variety of laser and light accessories.